Some of the best places to ride in the U.S.A. are our nation’s parks! Some of the best places to ride in the U.S.A. are our nation’s parks. I had heard that Bryce Canyon National Park was one of the best in America. Having gone to some pretty spectacular parks, including Yellowstone and Haleakala, I was excited to take on Bryce—and wasn’t let down by the ride. 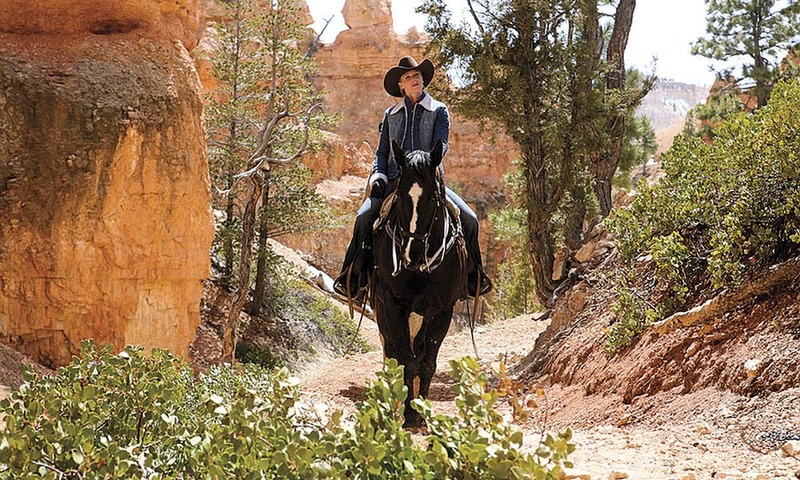 I was fortunate to be guided by “The Kid,” a black Quarter Horse who’s ridden into Bryce Canyon National Park countless times—a veteran and expert—a horse who knows exactly what potholes to avoid on the trail for a safe journey. It’s this kind of mount that will make one feel a bit more at ease when journeying the 1,000 feet from the rim to the canyon floor on the Rim Trail, which follows the edge of the cliff above the Bryce Amphitheater. Some people get a little nervous riding the Rim Trail, because of the steep drop off on the one side, but I felt just fine on my sure-footed horse, one advantage of traveling on horseback. Tawn Magnum, a guide with Canyon Trail Rides relates the myths and legends about the area to the author. I rode Bryce Canyon in the spring when the hoodoos were still spattered with snow, making the varied rusty red and pink colors stand out even more. Bryce Canyon is populated by hoodoos, spire rock formations weathered by time. Hoodoos can be found around the world, including Cappadocia, Turkey, but Bryce lays claim to the largest collection on the planet. The Paiute believed that these hoodoos were people who had been turned to stone. Other park visitors in years past, including Ebenezer Bryce, for whom the canyon is named, marveled at the maze-like qualities of the hoodoos. My guide pointed out a variety of creative shapes during our ride. We saw what looked like a sea lion, a ship, a beer bottle, and throughout the ride he recounted local myths and legends from the past and present about this mythical place. We passed through an area of Bristlecone Pine trees, one of the oldest living organisms on the planet. Here in Bryce, some of the Bristlecone Pine are over 1,000 years old. Cowgirls can bring their own horse or let Canyon Trail Rides guide you through a tour of the park. This is a spring, summer or fall ride, as a good bit of snow in winter makes some trails impassible. 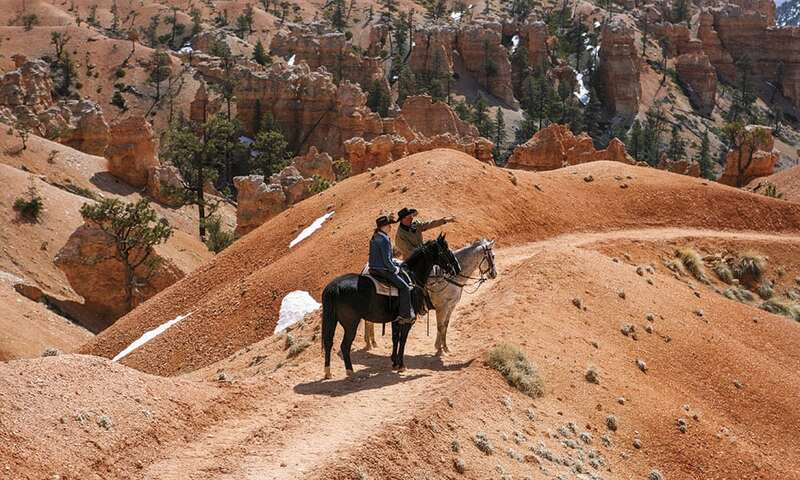 If you’re bringing your horse here to ride, make sure to coordinate with Canyon Trail Rides. As many riders know, unfamiliar horses don’t always get along with each other. You’ll want to be prepared for the changing altitudes in Bryce by keeping yourself and your horse hydrated. Pack layers, because the weather can change here on a dime. Horseback is a wonderful way to appreciate the hoodoos, spires of red rock, weathered and shaped by time.My favorite part of the ride, was the viewpoint over the Queen’s Garden. Here, the canyon opens up to a sea of hoodoos. This impressive area of hoodoos is said to be watched over by Queen Victoria. If you use your imagination, you may see her face in the rocks. As we rested for a bit to fully absorb the views, I noticed other travelers in the distance, slogging through the soft trail sands by foot. I smiled and patted Kid, who was letting me focus only on the views. Hoodoos spanned out like a labyrinth. As we exited the canyon, I realized that I could spend a lot of time at this park, staring at the brilliant colors and shapes that make Bryce like nowhere else, and let your imagination run free.